Swanton Morley post mill had the largest roundhouse recorded at any mill in Norfolk, being 2 feet higher than the massive Holt_Heath_postmill. The structure was 20' high to the eaves, incorporating three storeys and had a diameter of 26' 6". The roundhouse had two 14ft piers and two doors on the ground floor. The four double shuttered sails, each with 9 bays of 3 shutters, drove one pair of French burr stones and one pair of Peak stones. The 8 bladed fantail was set onto the ladder and Joseph Canham's model depicts a porch on the gable end of the mill. Francis Daynes was the miller in the 1840s and was married to Elizabeth Daynes. Francis died on 3rd May 1850, having written a will on 6th April 1849 that was proved on 20th July 1850. He left all his property to John Williams, his son of law, who was a farmer in Yaxham and husband of Francis' daughter, Elizabeth Williams. All his monies were left to his daughter Elizabeth and Francis’ wife, Elizabeth Daynes was to get a yearly amount of £ 20.00 for life. I give John Williams, his heirs, executors, administrators etc – all my messuage or dwelling house with outhouses, yard, garden, land and appurtenances to the same adjoining and belonging and also all that WINDMILL with the ROUND HOUSE, to the same belonging, standing and being on the said land with going gears, fixtures, machinery and appurtenances to the same belonging which premises are situate in Swanton Morley aforesaid and now in my own occupation. Samuel Barker, William Gunton, William Tillett, John Margerson, Samuel Leader, George Harris, Thomas Bone, James Jaevis, Absolon Bone, Henry Dawson, Elizbeth Peg, and James Doy. A JOURNEYMAN MILLER, that can bring a character from his last place, by Peter Ransom, Swanton Morley. WANTED, a steady industrious Single Man to work a WINDMILL with Patent Sails, winding herself; one willing to assist in the Bake office preferred. Must be a good stoneman. Apply to Daynes Williams, Swanton Morley near East Dereham. WANTED, a Single Man to work a WINDMILL. He must be a good STONEMAN, one willing to assist in the Bake office preferred. APPRENTICE WANTED. - A steady, active Youth to the MILLING & BAKING. Apply personally to Dayner (sic) Williams, Swanton Morley. Apply to Daynes Williams, Swanton Morley, East Dereham. WANTED, immediately, a Young Man as BREAD BAKER and to assist in a Mill. A good character required. Apply to D. Williams, Swanton Morley. WANTED immediately a YOUNG MAN with a good character as Assistant in the above business. WANTED, a steady and industrious MAN to take charge of a Windmill, must be thoroughly competent and trustworthy - one who can assist in the bake office preferred. Wages liberal. To Let with Immediate Possession (if required) a POST WINDMILL situated at Swanton Morley, driving two pairs of Stones, Flour Mill and Jumper and all other requisites, with large Bake House and Dwelling house, Garden, Stabling etc. The above are all in capital repair. A good Retail Business has been done for upwards of Sixty years. Satisfactory reasons can be given for its being disposed of. Application to be made to W. Warner, Esq., East Dereham. WANTED immediately, an active young man of good character as ASSISTANT. Age about 18. Apply to A. B. at the Mill, Swanton Morley near East Dereham. WANTED, a competent MAB to Work a WINDMILL and to assist in the BAKE OFFICE. A Married Man preferred; also JUNIOR HAND for both Trades. Good characters indespensible. Apply to Daynes Williams, Swanton Morley. WANTED, a steady industrious MAN, one willing to assist in the BAKE OFFICE. Good wages to a competent trustworthy HAND. Apply to William Daynes, Swanton Morley, East Dereham. In the village was an old wooden windmill the sails of which when we arrived were motionless: these now began to whirl round and round at a great pace for the thunder had brought up a great gale of wind. We saw the miller running up in haste from the public house where, doubtless in despair of doing any work that day, he had been indulging in some good Norfolk ale. Possibly he feared now lest his mill should ‘run on fire’ and was anxious to get the brake on, for these old wooden windmills often get burnt down by the speed at which their sails are whirled round in a storm that comes suddenly upon them. Is favoured with instructions from Mr. I. Critoph, who is relinquishing the business, to Sell by Auction. Sale at 12 noon. Thomas Cranmer, Auctioneer & Valuer, Estate Agent etc. East Dereham, Norfolk. Bakery and Windmill doing a large business, with good house and premises adjoining. Apply Springall & Son, Builders, Swanton Morley, Dereham. The boy with the crutches on the left in the above photograph, was Ben Beavis who went on to run a cycle repair shop in the village. In 1891 a 7hp portable steam engine was being used for auxiliary power but by 1904 this had been changed to a Crossley paraffin engine that was started using a blowlamp. Both engines were used to drive a pair of stones within the roundhouse. William Hilton took the mill over in 1891 and remained there until his death in 1907 when William's son Ernest took over the running of the mill. Ernest was also tenant at Elsing_watermill for 9 years from around 1915 - 1924 before returning to Swanton Morley. 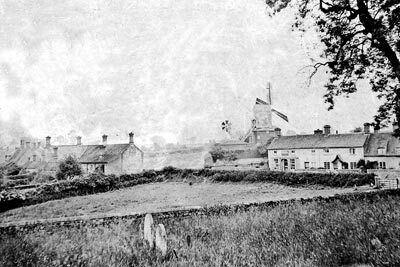 Talking of windmills, it is just over fifty years since the post mill at Swanton Morley was dismantled. This was a fine specimen in its day, and stood practically in the centre of the county of Norfolk, three and a-half miles from the market town of East Dereham. Standing on high ground overlooking the village street, the church and the Wensum Valley across which could be seen Belaugh Hall, this was a picturesque situation. 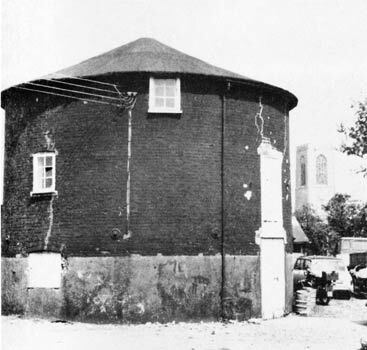 The round house is still standing and is in a remarkably good state of preservation. It is now being used for storage. 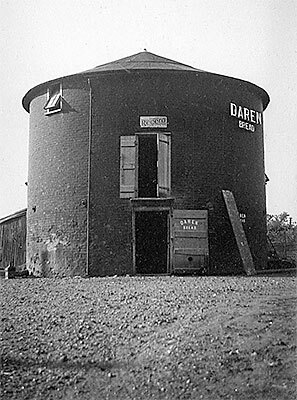 Inside this building can be seen the massive brick pillars, strengthened by iron bands, which used to support the weighty structure above, containing the sails, millstones, gear wheels, etc. Although only a lad at the time, there are many things I remember about this mill. The four sails were fixed to a long iron shaft, which weighed over a ton, through the centre of which passed an iron rod. This operated the vanes, causing them to open and close against the pressure of the wind. My father took over this mill in 1891 and it was at that time in fairly good working order. There were two pairs of stones, one pair being strictly kept for grinding wheat later to be made into flour or wholemeal bread. These stones were not used for any other purpose if it could possibly be avoided, as if they were so used the remnants of meal would have to be thoroughly cleaned out before the grinding of wheat could be resumed. The other pair were in general use for grinding barley, oats, etc. I remember the long periods which sometimes occurred when there was not sufficient wind to turn the sails, and the corn would continue to come from the neighbouring farms causing my father much uneasiness through not being able to grind. On these occasions he would anxiously wait for a breeze to spring up. I have known the sails to be merrily going round when there was practically no wind to be felt on the ground; although these conditions were occasionally in reverse, when there was no activity aloft. More than once I have known it to happen that after a long spell of enforced idleness the wind would rise in the evening and would continue to blow through the night, and then it meant working through the hours of darkness, illumination being by candles and a hurricane lantern. On certain nights when this occurred I have been allowed, as a special treat, to be in the mill most of the night with my father instead of going to bed. I used to consider this great fun, but I do not think he shared that view. However, the work had to be done while the going was good and such an opportunity was not to be lost. My father’s observance of the Sabbath was such that he would not grind on Sunday, however hard he was pressed. This reminds me of a certain Sunday afternoon, I think it was about 1896, when there was a tremendous gale. It was his custom to attend the service at the Methodist Chapel, and during the progress of the sermon someone came along and told him that his mill was “going round.” He knew, of course, that the brake was on and that serious damage would soon occur through friction. Accordingly, he had to hurry home and release the brake allowing the sails to revolve with as little wind pressure on the vanes as possible. So far as I remember however, no serious damage resulted, although there were plenty of casualties to other buildings in the locality. When the direction of the wind changed suddenly, the spin-wheel at the back would operate automatically and change the whole structure round, so the sails were always facing into the wind. If we were working inside the mill for several hours during the night, this might happen while we were quite unaware of it, so that when we descended the long steps outside, they would be in a different position. This mill, along with many others, became obsolete about the beginning of the present century. I was not living at home when it was actually demolished, therefore I did not see the ponderous sails and shafting lowered to the ground, but I know of at least man who helped take it down. Anyway, it is a good thing it was not allowed to rot away gradually as were so many of these interesting old relics of the past. And I devise All that messuage or dwellinghouse with the building formerly a Windmill with the outhouses buildings yard garden land & premises adjoining or near or belonging thereto or held therewith now in the occupation of Wm. Hilton. 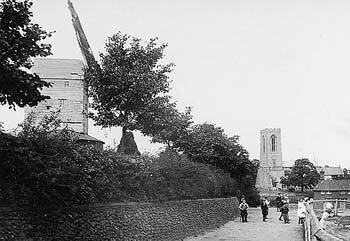 In 1906 the body of the mill was demolished by the local carpenter Joseph Canham assisted by Albert S. (Sparrow) Rump, who went on to become sexton. Joseph Canham later made a large scale model of the mill. 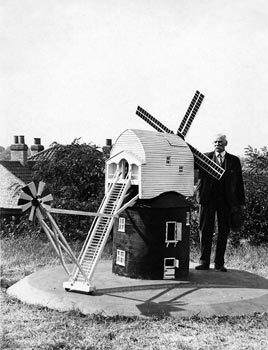 Mr. Joseph Canham, of Swanton Morley, who is nearly 80 years of age, has built a model of a windmill that was dismantled at Swanton Morley before the war. Everything in the model has been hand-made, even the hinges on the doors, by Mr. Canham, who helped in dismantling the old mill. 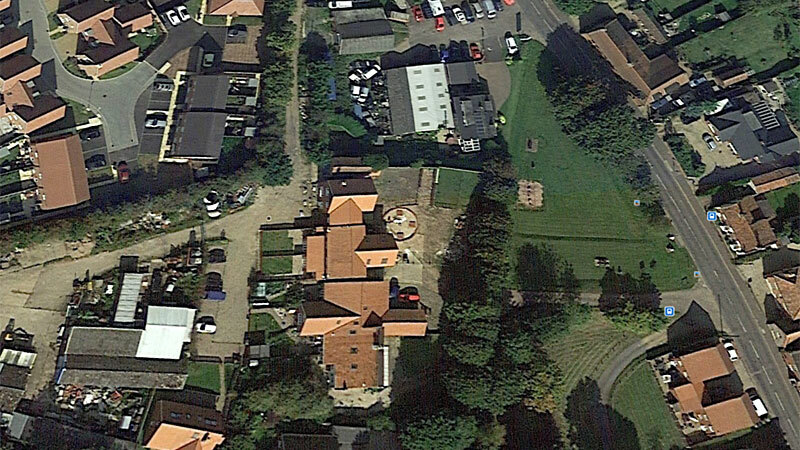 The model has been fixed in a cement plot in the grounds of Mr. H. W. Fox, of Quebec Road, Dereham. The model was moved to the garden of “Holmlea” in Swanton at sometime. More lately “Holmlea” was occupied by Emma’s grand children Ray and Edna Hilton. Ray looked after the model for many years and I took the above photo of it in 1988 but it fell into disrepair after Ray’s death in 1995. After Edna’s death in 2000 the house was sold and the model was removed for restoration I am not sure of it’s whereabouts now, I think it may be back with the Canham or Rump family. In August 2007, Alistair Milne of the Mill House reported that the model was indeed back with Joseph Canham's son Clive in the village. 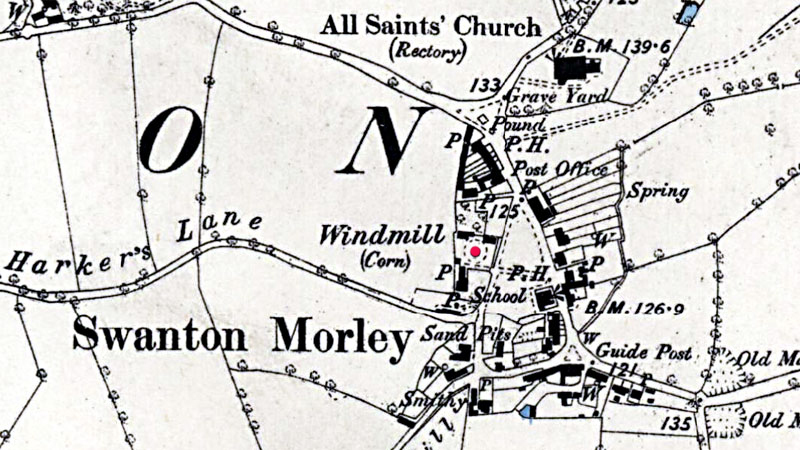 Talking of Windmills, it is just over 50 years since the post mill at Swanton Morley was dismantled. This was a fine specimen in its day and stood practically in the centre of the County of Norfolk, three and a half miles from the market town of East Dereham. Standing on high ground overlooking the village street, the church and the Wensum Valley across which could be seen Bylaugh Hall, this was a picturesque situation. The roundhouse is still standing and is in a remarkably good state of preservation. It is now being used for storage. Inside this building can be seen the massive brick pillars strengthened by iron bands which used to support the weighty structure above, containing the sails, millstones, gear wheels etc. Only a lad at the time, there are many things I remember about this mill. Then four sails were fixed to a long iron shaft, which weighed over a tonne, through the centre of which passed an iron rod. This operated the vanes causing them to open and close against the pressure of the wind. My father took over this mill in 1891 and it was at that time in fairly good working order. There were two pairs of stones, one pair being kept strictly for grinding wheat later made into flour or wholemeal bread. These stones were not used for any other purpose if it could possibly be avoided, as if they were so used the remnants of meal would have to be thoroughly cleaned out before the grinding of wheat could be resumed. The other pair were in general use for grinding barley. oats etc. I remember the long periods which sometimes occurred when there was not sufficient wind to turn the sails and the corn would continue to come in from the neighbouring farms, causing my father much uneasiness through not being able to grind. On these occasions he would anxiously wait for a breeze to spring up. I have known the sails to be merrily going round when there was practically no wind to be felt on the ground; also these conditions were occasionally in reverse when there was no activity aloft. More than once I have known it to happen that after a long spell of enforced idleness, the wind would rise in the evening and continue to blow through the night and then it meant working through the hours of darkness, illumination being by candles and hurricane lantern. On certain nights when this occurred, I have been allowed, asa special treat, to be in the mill most of the night with my father instead of going to bed. I used to consider this great fun, but I do not think he shared the same view. However, the work had to be done while the going was good and such an opportunity was not to be lost. My father's observance of the Sabbath was such that he would not grind on Sunday, however hard he was pressed. This reminds me of a certain Sunday afternoon, I think it was about 1896, when there was a tremendous gale. It was his custom to attend the service at he Methodist Chapel and during the progress of the sermon, someone came along and told him him that his mill was 'going round'. He knew, of course, that the brake was on and that serious damage would soon occur through the friction. Accordingly he had to hurry home and release the brake, allowing the sails to revolve with as little wind pressure on the vanes as possible. So far as I remember, however, no serious damage resulted, although there were plenty of casualties to other buildings in the locality. When the direction of the wind changed suddenly, the spin-wheel at the back would operate automatically and turn the whole structure round so the sails were always facing into the wind. If we were working inside the mill for several hours during the night, this might happen while we were unaware of it so that when we descended the long steps outside, they would be in a different position. This mill, along with many others, became obsolete about the beginning of the present century. I was not living at home when it was actually demolished, therefore, I did not see the ponderous sails and shafting lowered to the ground, but I know of at least one man who helped to take it down. Anyway, it is a good thing that it was not allowed to rot away gradually as were so many of these interesting old relics of the past. 'H. W. B.' 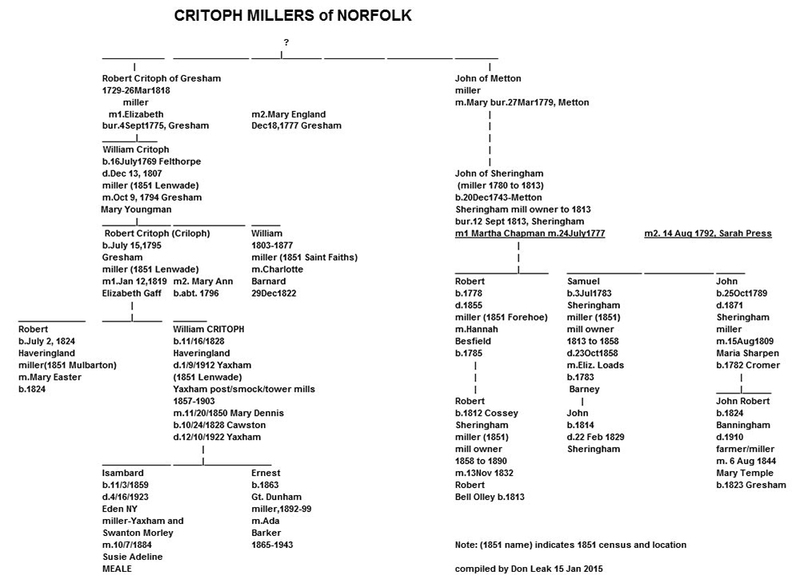 was Bertie William Hilton, son of William Hilton , the miller 1891-1906. The gale was probably that of 24 March 1895, a disastrous day for several Norfolk windmills. The 'one man who helped to take it down' would have been Albert S. Rump, later the sexton. Mr. Raymond A. Hilton & Miss Edna Hilton, Holmlea, Town Street, Swanton Morley. In 1904 mill had auxiliary power a Crossley paraffin engine started with a blow lamp. Body of mill taken down in 1906 by Joseph Canham, a local carpenter assisted by Albert S. Rump, to whom I spoke today. 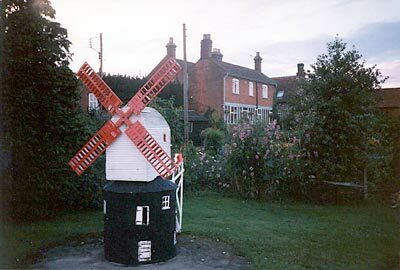 R. A. Hilton has the model of the mill made by J. Canham, at one time in the garden of H. W. Fox, 15 Quebec Road, Dereham. Body too low and narrow in proportion to its length and sails too short. Has 8-bladed fantail and gable end porch. In March 1928 the mill complex was sold with Ernest Hilton as tenant at the mill. The full text of the newspaper advertisement is available in the form of a downloadable_pdf_file. Ernest Hilton's mother, Emma bought the property and they remained at the mill house until 1950, when the family moved to another house in the village Holmlea, due to Ernest's ill health. I have just looked at your website after seeing the photo of the mill in the Dereham Times which was submitted by your society. I was particularly interested as the man in the doorway is my grandfather Ernest Hilton. On the 18th September, in the report in the Times of the closure of the Mill Bakery it was stated that the distinctive black round building used as a store is to be demolished when the site is developed for housing. As you know, this round black "store" is the base of the original mill, and I have written to the paper hoping they will print my letter and attaching the photo of the mill showing this. I can't believe they will be allowed to demolish the mill base. Do you have any influence to prevent this happening? Your web site is excellent and I'm looking forward to finding out more about the mill and Elsing Mill, where my grandfather was a tenant for 9 years, the only time he was away from Swanton Morley. 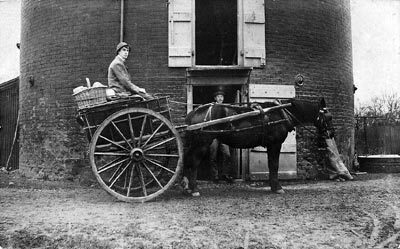 I remember the rounds man from the bakery was a Mr Price in the 1930s he had a horse and cart and would come to the door with the bread in a basket with a sack over the top, there were 2 types, large or small. He was still around mid 1940s because one of my school mates ran into the cart on his motor bike .. I don't expect he washed his hands all day but we are still here. I knew many of the names to do with the mill and had been inside when it was working with the engine and knew all the Hilton family. Daynes Williams (23) b.E. Dereham, miller & baker.